Barcelona is hands down one of the most beautiful cities in the world. This is great, but it also makes planning date night almost impossible. For a date night you’ll be able to tell your grandkids about, why not use some of the following ideas… Better still; book one of our romantic and cosy two person apartments for that extra touch! Who says that date night can’t be during the day? 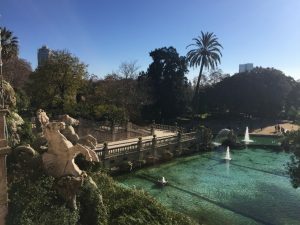 Why not start with a walk in Barcelona’s most beautiful park, Parc de la Ciutadella. Take a blanket and a picnic, and sit below the shade of the tall palm trees. If you’re lucky, they’ll be someone with a guitar playing music nearby creating the ultimate romantic backdrop and serenade for your picnic. If you fancy something a bit quieter, head to Parc del Laberint d’Horta, a peaceful spot with a small hedge maze, or read more about Barcelona’s secret gardens. Want to get out of the city for the day? There are plenty of nearby coastal towns and villages easily accessible by train or bus. For a list of some of the great day trips outside of Barcelona, follow the link. Strapped for cash? Read about Barcelona day trips on a budget. What’s more romantic than sunset and 360° panoramic city views? Nothing, the answer is nothing. Just before it gets dark, buy a bottle of wine and head to the Bunkers del Carmel, one of Barcelona’s secret viewpoints north of the city. Although the climb is steep, the views are more than worth the wait. Another great option for when the sun goes down is Plaça Espanya, home of the Montjuic Magic Fountain. With an unmissable unique fountain and light show, this superb spectacle is great to round off any date night. 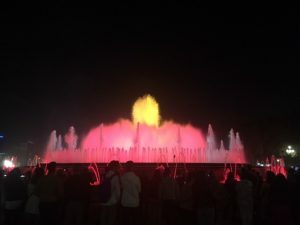 Read more about Montjuic Magic Fountain performance times. Of course, some of the most traditional date nights take place in a bar or a restaurant. If you want to treat your taste buds as well as your partner, read about the top Michelin Star restaurants in Barcelona. If you’d prefer the venue to do the talking so you don’t have to, read about some of the best themed bars and restaurants in Barcelona. 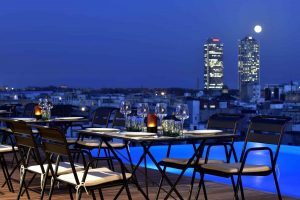 Or if you’re after even more views of the city and some delicious cocktails, read about the best rooftop bars in Barcelona. However you plan to spend date night, we hope that it is special. Barcelona truly is an incredible place.